An ongoing task is for me to go round the house and measure each device’s energy consumption using a plug-in meter. I try to measure the total energy consumed over a week and then calculate the following figures. All the figures below are either direct measurements using a plug-in power meter or are calculated from those measurements. The”av kWh per 24 hours” figure is either measured by leaving the plug-in meter clocking up the consumption of the device over several days or, for devices which draw power all the time, by multiplying the wattage by 24 hours. I’m somewhat surprised at how hungry the Fridge and Home Theatre PC are. 154kg of CO2 per year is roughly equivalent to a single flight from London to Berlin for 1 person. We don’t buy meet at home (except for dog food) so it has occurred to me in the past that we could actually get by with a much smaller fridge freezer, especially if we’re successful in growing a lot of our own food and veg. But the fridge is only a few years old so we’re not going to get rid of it any time soon. Maybe I should dig out the manual and see if there are any settings which are more energy efficient. How accurate is the clamp meter? You’ll remember from physics class that electrical currents flowing through a conductor induce a magnetic field. The alternating current running through the red cable feeding power into the house induces an alternating magnetic field which, in turn, induces an alternating current in the coil of wire in the smart meter’s clamp. The voltage across this coil is then measured, digitised, sent wirelessly to the AlertMe base station and then sent over my ADSL modem to AlertMe’s website. As to whether or not the smart meter is reading accurately… I can’t figure out a really clean, simple way to check this (not least because our house meter’s rotating disk doesn’t give a high resolution instantaneous measurement of power, which is what the smart meter produces). 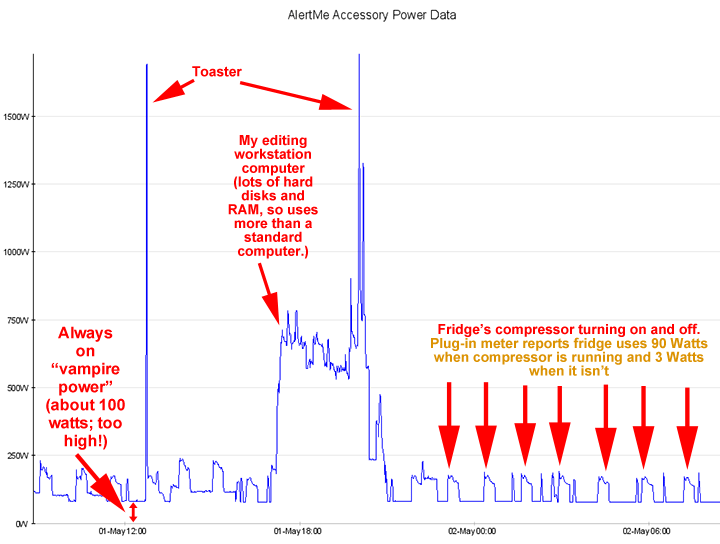 My best attempt so far has been to compare Google’s “total power used on 3rd May” to my meter readings. Except I didn’t take meter readings at 03/05/2010 00:00:00 and 04/05/2010 00:00:00 so I’ve had to interpolate between my actual meter readings back to midnight (which isn’t going to be very accurate because our power usage is distinctly lumpy). Google reports that we used 4.7 kWh on 3rd May. My interpolated meter readings suggest we used 4.84 kWh for the 3rd May. So they’re within range. I suppose I should try to take some meter readings at midnight. As far as I’m aware, the “inductive clamp” sensor should be pretty accurate with high power factor loads (like tungsten lamps) but less accurate with low power factor loads (fluorescent lamps, switched mode power supplies including PC power supplies etc). But, to make matters worse, the electromechanical meter also gets confused with certain types of loads. So, in other words, it’s relatively easy to measure the power consumed by a single tungsten lamp, but it’s non-trivial measuring power consumed by devices like PC power supplies or fluorescent lamps. But this “power factor” stuff is a bit beyond my understanding of the physics; I need to read up more about it.